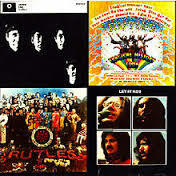 This is a compilation of songs from their albums Meet the Rutles, Tragical History Tour, Sgt. Rutter’s Darts Club Band, and Let it Rot, plus songs from their movies A Hard Day’s Rut, Ouch!, and the animated Yellow Submarine Sandwich. Their 1978 television special All You Need is Cash told the story of the four young men from Liverpool and their rise to stardom. Now I haven’t heard any of this since, well, 1978, but I still recognized all the songs, at least the ones they had parodied, often more than one to one. They got the Beatle sound down without duplication, which progresses by paralleling the short but long in our memories, career of the Beatles. It was the brain-child of Monty Python’s Eric Idle and Python extra and musician Neil Innes, who wrote all the songs. The pair also played the Paul and John type characters. The executive producer was SNL’s Lorne Michaels, but I believe George Harrison had a role in it, more than just his performance in the special as a reporter, which if I remember correctly made me aware of why George never had many lines in the Beatles’ movies. But the show was very clever, complete with an all-star cast including Bill Murray as Bill Murray the K (no one will get that), and interviews with Mick Jagger and Paul Simon, whose answer to the question: Did the Rutles influence you at all? was simply: No. The album of the songs from it is just delightful. I had fun listening and working out and grinning from ear to ear.